As product managers, one of the most important documents you create is your product roadmap. The product roadmap is a vital way to keep you, your team and your stakeholders informed and engaged with your product goals and priorities. 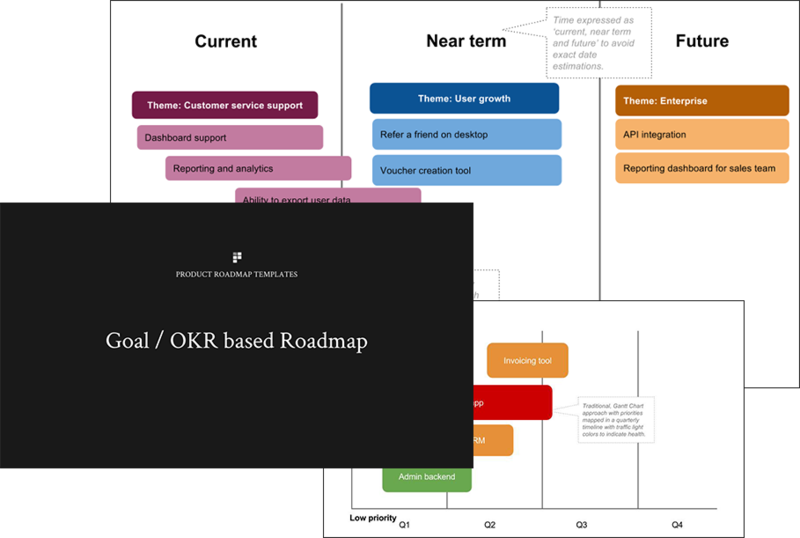 The product roadmap is a device which allows product managers and product teams to communicate the direction, vision and priorities of their product. In this series by the Department of Product, we help you to visualise your roadmap. A clear product roadmap means your stakeholders are always up to date with the product development strategy. Clear communication and clear visualisation results in less confusion and more clarity. With a roadmap built to suit your product, you will have confidence that it demonstrates clearly what your goals are for the product and the business. There is no single way to visualise a roadmap. Take some time to understand your product, your business and your team. That way, you can choose the roadmap visualisation approach that meets your needs best. Every business and product team should have clearly defined goals or objectives and key results (OKRs). This product roadmap allows you to clearly demonstrate to stakeholders and your team how each of your key initiatives links explicitly back to the goals you’re trying to achieve. OKRs are typically time bound so this should be included in the product roadmap as a clear marker. It’s often difficult to explain to your stakeholders and your immediate team the relative complexity of projects and features. Using the size scaled roadmap helps you to clearly communicate the relative size and complexity of each feature by sizing each feature at a different scale. Upcoming features and projects are plotted on a traditional Gantt Chart to allow the business to have greater visibility of ongoing priorities. The Y axis plots the priority level and the X axis plots estimated time when development begins. A traffic light system is used to indicate overall health of the feature / project. Your product roadmap is split into larger themes e.g. customer retention, making it easier to visualise what part of the business each of the features relate to. Color coding according to each theme also helps to differentiate between the features. High level detail of each feature is preferable to delving into specifics. Specific details should be kept on a separate slide for each features. You don’t have to use an off the shelf roadmap solution for it to be a viable way to communicate your product strategy. Using the dashboard technique often employed by engineers, this roadmap is a customisable dashboard on which you can add your key goals, priorities and metrics. This works particularly well as a physical board. The discovery & delivery product roadmap makes a visual distinction between the items that have been agreed and have been clearly scoped out (delivery) vs. the pieces that are in ‘discovery’ mode where the requirements are not yet clearly defined and you’re yet to make final product decisions.